The rise of India TV as India's leading news channel owes a lot to the vision of its chairman and Editor-in-Chief Rajat Sharma and the dedication of its team of bright professionals. 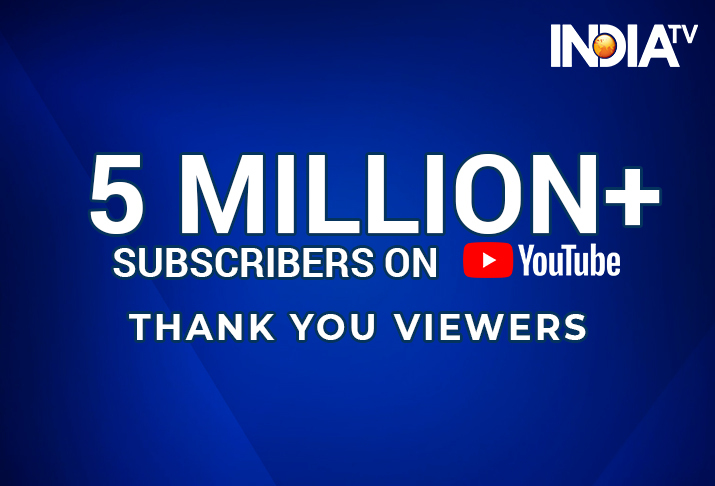 India TV thanks all its viewers as the country’s leading Hindi news channel has crossed 5 million subscribers on its YouTube channel. At present, India TV’s YouTube channel (www.youtube.com/indiatv) has 5,029,272 subscribers. Keep watching India TV and subscribe our YouTube channel (www.youtube.com/indiatv) for Live TV, latest video updates, show videos like Aaj Ki Baat, Aap ki Adalat and other news bulletins. Within a short span of time, India TV has earned the reputation for credible reporting, courage and espousal of public interest which is of great value to all stakeholders. The channel has its bureau and sales representation across the country. India TV has state-of-the-art digital connectivity and a new centre covering an area of 80,000 square feet in Noida. The rise of India TV as India's leading news channel owes a lot to the vision of its chairman and Editor-in-Chief Rajat Sharma and the dedication and toil of its ever-growing team of bright news TV professionals. India TV group includes 24X7 Hindi news channel India TV, English Digital news platform www.indiatvnews.com, Digital Hindi news website www.khabarindiatv.com and Hindi business news site www.khabarindiatv.com/paisa.